After 125 years in San Diego, a historic jewelry store is closing its downtown San Diego location later this month. Jessop Jewelers, located at 401 West C St., will shutter on Feb. 17 as its owner, Jim Jessop, retires. The business will host a final event Saturday at 2 p.m. at its downtown location, where a crowd is expected to come out and celebrate the Jessop family's traditions and place as a historic San Diego business. During the event, the store will raffle off a Burma ruby jewel flanked by two diamonds worth an estimated $6,500. The Jessop family's gemstone and fine jewelry business has been around since 1892 after watchmaker Joseph Jessop moved his family from Lytham, England, to San Diego. Joseph Jessop opened his first watch repair and jewelry shop on F Street. The family would later open the J Jessop & Sons jewelry store at 952 Fifth Ave. In 1991, the jeweler moved to its current location on West C St. Per the Jessop Jewelers website, the business has kept a sharp focus on family values and building personal connections with their San Customers for the past twelve-and-a-half decades. San Diegans will remember Jessop Jewelers for its famous street clock, which has been located in the center of Horton Plaza mall's main level since 1984. The clock, adorned with 17 jewels and containing 300 moving parts, took 15 months to build. According to the Jessop Jewelers website, Joseph Jessop was inspired to build the clock after a trip to Bern, Switzerland. He was impressed by all of the clocks displayed in public places there and wanted to recreate that in San Diego. The clock was completed in 1907 and originally installed in front of the J Jessop & Sons jewelry store on Fifth Avenue. The Jessop clock was granted landmark status by the San Diego Historical Resources Board in 1998; it is also known as San Diego Landmark No. 372. If you look closely, you might see a tiny, wooden toy bear lodged inside the clock's pendulum. In 1907, while the master clock movement was on display at the Sacramento State Fair, a child holding the toy bear decided to place it on the pendulum so it could go for a ride. The bear became wedged inside a small ring and removing it was too difficult, so the Jessop family left it in there, forever to ride inside the clock's movement. 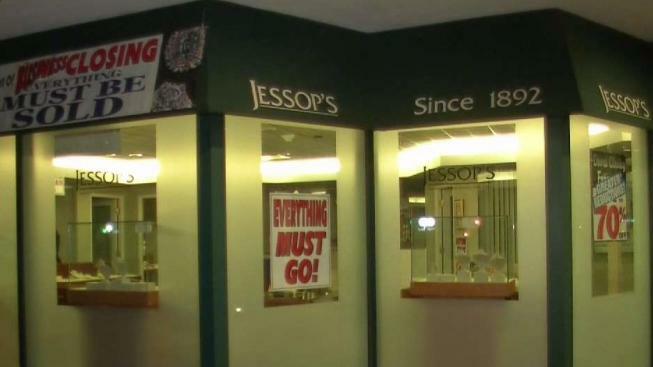 With the closure of Jessop Jewelers, the clock may also experience some change. A spokesperson for the family told NBC 7 Saturday that the Jessop family, through its foundation, still plans to manage and maintain the clock, though it may not be relocated from Horton Plaza mall to somewhere else in the city. The family spokesperson said "plans are underway to work on a permanent new space for it" but those details are, for now, still being worked out.